This beautiful 2649 Sq.Ft 5 Bed, 3 Bath home sits on a peaceful 3.4 Acres, is surrounded by Orchards, Vineyards and has views of Quamichan lake. The convenient ground level entry has the master bed with Ensuite, a Large living room with wood burning Fire place, Kitchen & Dining room with lots of natural light and a main bath for your guests. Upstairs you will find 4 additional bedrooms and a 4 piece bath. Bonus lower level family room or could be used as a space for the kids to play. Large Double car garage, Heat pump and Newer roof. Fully fenced yard with many fruit trees and mature landscaping throughout.Just 10 mins to downtown Duncan. This home has been meticulously maintained inside & out, a must see to truly appreciate! Duncan serves as an economic hub for the Cowichan Region. We provide healthcare, retail and professional services, and cultural tourism. We are a major business centre for the fishing, farming, forestry and tourism industries; key drivers of the regional economy. Our downtown features a number of heritage and vintage buildings, and a large array of small, exquisite shops and restaurants catering to all tastes. Enjoy the cultural comings and goings in our busy new City Square – part of our exciting revitalization plan – or tour the world’s largest collection of outdoor totems. The City of Duncan is a member of the Cowichan Valley Regional District (CVRD). The CVRD provides regional governance and services to both electoral areas and member municipalities – Duncan, North Cowichan, Ladysmith, and Lake Cowichan. For the City of Duncan, they provide solid waste management, emergency planning, economic development, regional parks, as well as a wide array of other services that benefit Cowichan Valley residents. The City of Duncan takes great pride in its parks. Green spaces promote healthy living and a sense of place and community as people walk, play, and attend events. Parks and green spaces reduce pollution, and provide a venue for adults and youth to stay active. Exposing young people to the joys of outdoor activities in open spaces such as parks helps mould future generations into individuals who are concerned about the environment, and therefore are committed to revitalizing and enhancing the urban park system. The sports fields at McAdam Park and Rotary Park can be booked for sporting events. View the Map of City Parks. There are grassy, treed green spaces throughout Centennial Heights, on Pine Avenue, and at 75 Station Street, which is the perfect place to sit and have a break, while surrounded by a mural on one side and totem poles on the other. The Cowichan Regional Parks and Trails function is separate and distinct from the community parks programs currently provided within the electoral areas and municipalities of the Cowichan Valley Regional District (CVRD). Regional Parks and Trails are intended to coordinate, complement and enhance the parks and protected areas programs managed by all levels of government – regional electoral areas, municipalities, Provincial and Federal. In summary, Regional Parks are established for all residents of the CVRD for the benefit of the entire Cowichan Region. In 1990, community members came together with a dream – to build a home for a number of sports that did not have adequate facilities elsewhere in the community. Since that time, the Sportsplex has grown to include 3 ball diamonds, lacrosse box, grass field, running track, children’s playground, outdoor fitness equipment, and 660m rubber fitness path. The Sportsplex will be part of the 2018 BC Summer Games! The Cowichan Aquatic Centre, run by the District of North Cowichan, features a full-featured aquatic venue that includes a wave pool, lazy river, twin water slides, 8 lane 25-metre competitive lap pool, steam room, sauna and swirl pool. There are also an abundance of fitness classes, full fitness centre, meeting spaces, birthday parties, and more. Duncan is located on the traditional lands of the Cowichan First Nation on Vancouver Island. The Cowichan peoples have lived here for millennia; with the settlement of Vancouver Island, life for them changed forever. By 1858, Vancouver Island was British-controlled but it was in danger of being lost to the Americans due to the influx of people seeking their fortune in the Gold Rush. In order to encourage settlement, land could be acquired cheaply through preemption. The establishment of Duncan very nearly didn’t happen. The main access to Duncan was by traversing the Goldstream Trail or arriving through the ports of Maple Bay or Cowichan Bay. Pioneer William Beaumont was so sure that Maple Bay would be the urban centre of the Cowichan Valley that he owned and operated both a store and a hotel there. Maple Bay was a bustling port, where settlers’ boxes, goods, and passengers arrived by steamer. However, the development of another form of transportation dashed Beaumont’s dream for Maple Bay. The era of the railway helped to make Duncan, not Maple Bay, the commercial centre of the Cowichan Valley. It w as originally called “Alderlea”, a name given to the area by William Chalmers Duncan, whose farm shared the same name. Tracks from the railway built in 1886 crossed Duncan’s land and it was referred to as “Duncan’s Crossing”. After the first train station was finally built in 1887 it was called “Duncan’s Station”. 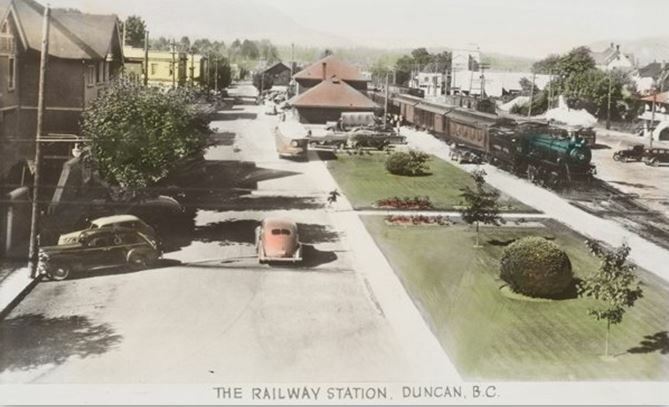 “Duncan” became the official name when the city was incorporated in 1912, but the post office didn’t change the name from “Duncan’s Station” until 1926. Agriculture was the first economy of the new settlement, followed by early attempts at logging. But it was copper mining on Mt. Sicker that propelled the sleepy little town of Duncan’s into the 20th century. Duncan experienced a building boom prior to WWI. Merchants and trades people built their businesses catering to the needs of new settlers, farmers and miners. Herbert Keast’s livery stable and blacksmith Robert Grassie prepared horses for their long journey up Mt. Sicker to deliver supplies. Dobson, Evans, Duncan, Whittome, Leather, Castley, Price, and Jaynes were just a few of the pioneer names that were integral to the development of Duncan. Duncan merchants began to cater to a relatively new breed of settler called “Remittance men”. These were usually the younger son s of wealthy and sometimes titled British families who, through lack of opportunity at home, needed to find a place in which to start a new life. Where better than the outreaches of the British Empire? Accustomed to fine goods and services, Remittance men, who were occasionally referred to as the black sheep of the family, received a quarterly remittance, or stipend, and could afford both necessities and luxuries. The Cowichan Valley was also a haven for British military retirees who could live comfortably here on their pensions. 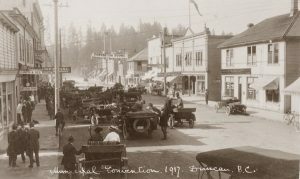 As the townsite grew, merchants and residents, agitated by the lack of services and proper roads, felt that the taxes they paid to the Municipality of North Cowichan should be used to improve conditions that had become intolerable. They petitioned the Province of British Columbia to secede from the Municipality and incorporate Duncan as a city. The City of Duncan was incorporated on March 4, 1912. 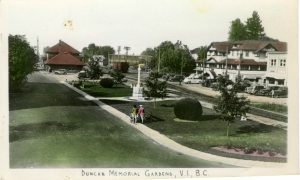 One hundred years ago, Duncan was establishing itself as the urban centre of the Cowichan Valley. The aspirations of the new city were expressed in the erection of impressive buildings as well as the development of services – a hospital, power station, post office and schools. It was a small city with a lot of contrasts. When guests of the elegant Empress Hotel in Victoria who were travelling north inquired about comparable hotels in Duncan, the newly built Tzouhalem Hotel was inevitably suggested. Cowic han peoples could sometimes be seen in their regalia in Duncan. Farmers delivered cream to the Cowichan Creamery and stayed to buy goods or visit one of the many establishments. Chinatown was an enclave of the city where Chinese miners from Mt. Sicker could have a bite to eat, buy supplies or gamble. The newly-minted City of Duncan would have been a fascinating place to be. 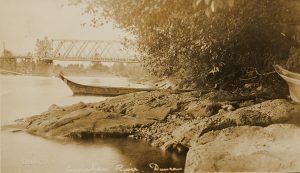 This exhibition explores the early settlement of Duncan through a series of archival photographs from the collection of the Cowichan Valley Museum & Archives.